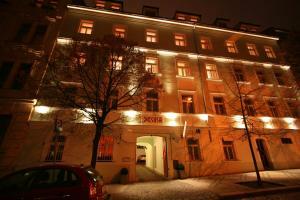 The Hotel Saint George is set in a renovated historic building dating from the 18th century. It is located 700 metres from Wenceslas Square and offers a wellness area featuring free use of a hot tub and fitness facilities. 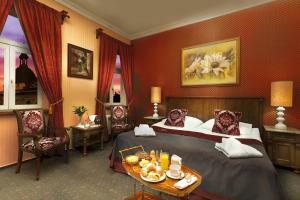 The interiors at the Saint George are elegantly decorated with Biedermeier-style furniture. The spacious rooms all feature air conditioning, satellite TV and a minibar. Guests can relax in a lobby bar, which is opened from morning to late evening. Restaurant U Bile Kravy, Prague Guest reviews: 9,4/10 ~ 0,6 km from Hotel Saint George Address: Rubesova 10, Praha 2, 120 00, Prague. Cuisine: French. Restaurant The Alcron, Prague Guest reviews: 9,4/10 ~ 0,8 km from Hotel Saint George Address: Stepanska 40, 110 00, Prague. Restaurant U Kroka, Prague Guest reviews: 7,4/10 ~ 1,1 km from Hotel Saint George Address: Vratislavova 12, 12800, Prague. Cuisine: Czech. 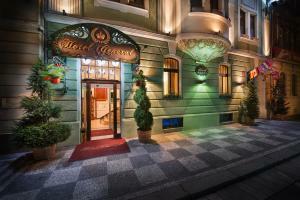 Restaurant Estrella, Prague Guest reviews: 9,4/10 ~ 1,1 km from Hotel Saint George Address: Opatovicka 17, Prague. Cuisine: Vegetarian. 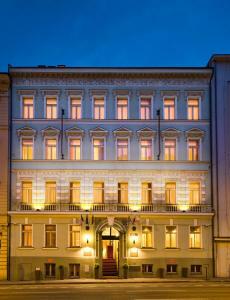 Restaurant V Zatisi, Prague Guest reviews: 9,2/10 ~ 1,6 km from Hotel Saint George Address: Liliova 1, 11000, Prague.